It started with a quick sortie to get a puncture repair kit for the wheelbarrow that was required to carry some tools. Go Outdoors was nearest and I have used their green “Slime” before. At about 9.30 am I was in the Clearbrook car park removing the valve from the flat tyre, squirting in the green goo, replacing the valve and pumping up the tyre. Such dedication – and it worked! A section of cleared leat. The weather was grey to start with and became progressively damp. 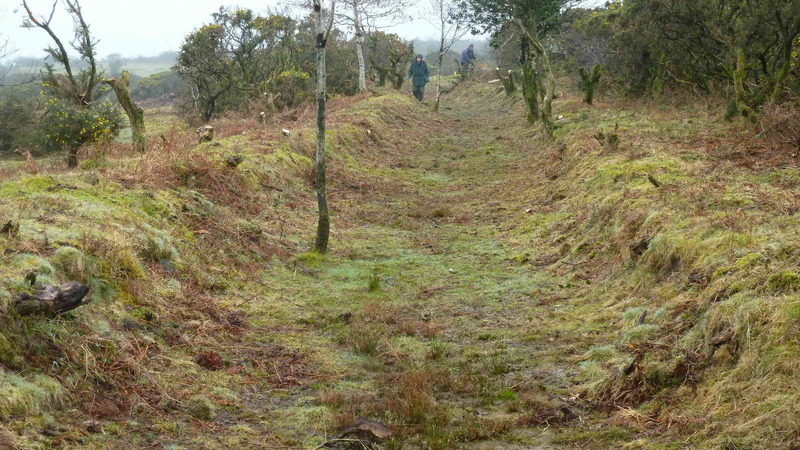 The cleared section of leat in the photograph above shows how almost any section of the cleared leat looks like in this area, under a grey sky! White fungus growing on dead wood. 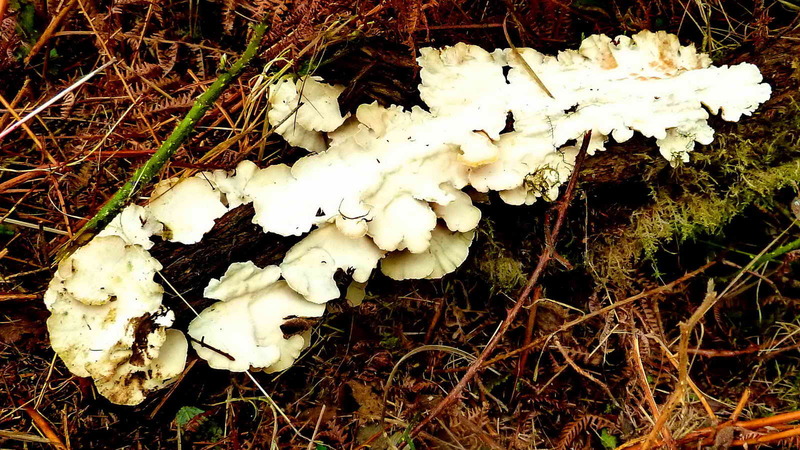 At one point a spectacular white fungus was found growing on dead wood, a piece of it is shown in the photograph above. 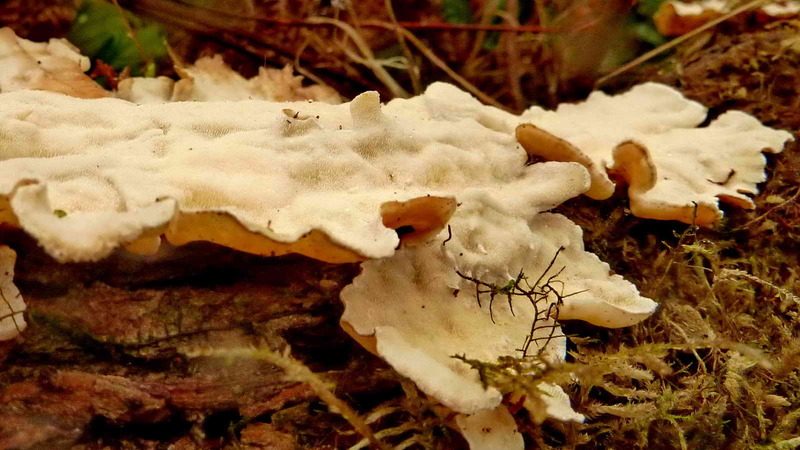 White fungus growing on dead wood – closer view. The photograph above shows a closer view. Lunch time on the leat. On this occasion,I have to thank Bill Radcliffe, Chris Francis, Derek Collins, Elaine & John Viant, Hilary Luce, John & Rachel Watson, Mally Stephen, Nigel Peace, Stephen Barrow, Sylvia Hamilton and Val Barns, who with myself, Keith Ryan, made a total of fourteen volunteers. There is also a special ‘thank you’ to Rachel for the very nice walnut chocolate cake at coffee time. The Leats Cake Liaison Sub-committee seems to be working well! 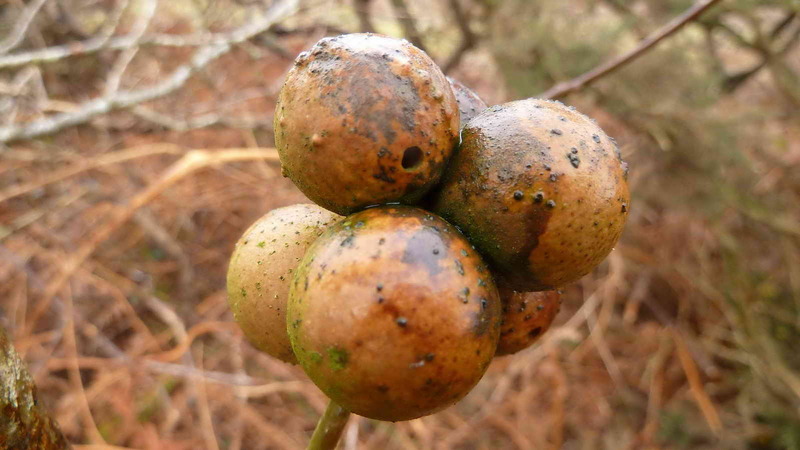 Part of an oak apple tree! 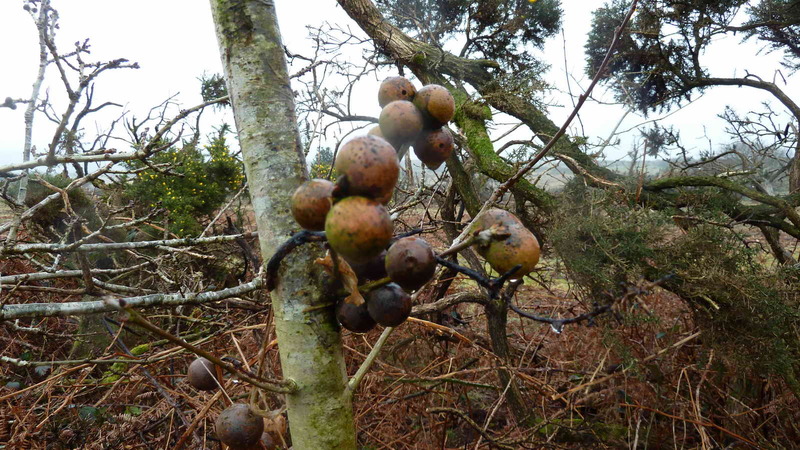 At one location, a very young tree was seen that bore several accumulations of oak apples – see the photographs above and below …..
Closer view of some oak apples. With the weather closing in, we found the gentle falling mist, if I can call it that, was very ‘wetting’, strangely so and perhaps more so than proper falling rain – it crept everywhere! I decided that as we had been really quite effective in our efforts, we would tidy up after lunch at 1 pm and call a halt to the exercise. 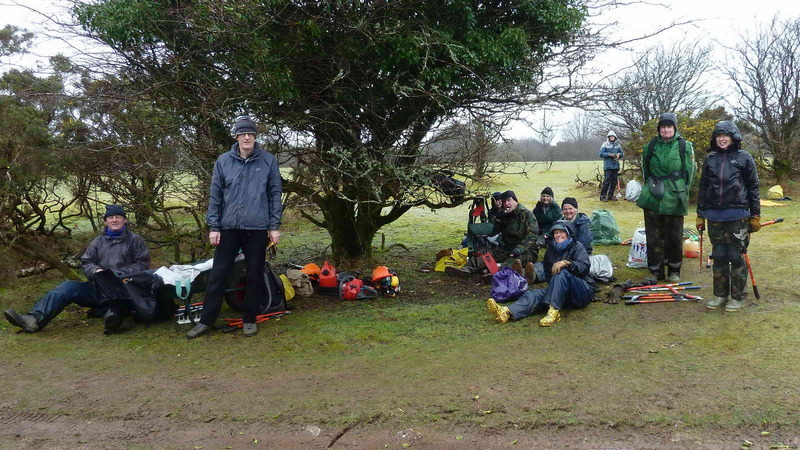 We had lunch mainly under some hawthorn trees, tidied up and left at just before 2 pm. During the lunch period, I walked the length of the leat that had been cleared on the last visit (Fri. 21st February) and today, with my GPS unit. The results can be seen HERE. In total, we have cleared 314 metres (±4 metres). Apart from a few stumps that were left for the chainsaw, when it was getting too wet to cut safely, the leat is looking good. The next section runs across the golf course and that may fall in the remit of the club, this is yet to be determined.